This is the version of the druid class I came up with for use in my Dwimmermount campaign. It was intended primarily for NPCs. I'm not sure I'd ever allow a druid PC except under very special circumstances. Druids are a secretive sub-class of cleric, but their allegiance is not to a god but to Nature itself. As a consequence, they do not abide by human moral concepts, adopting instead a philosophy dedicating to protecting the balance of all things. That balance just as often requires acts that non-druids view as evil as those they view as good. This, combined with the fact that druids view Lawful civilization as an impediment to their plans, makes them objects of much fear and distrust. Unlike clerics, druids eschew the use of metal armor or shields, preferring instead leather or wooden armor and shields. They may use most weapons, except crossbows and bows. Druids use the same experience point tables as clerics, as well as sharing their attack, spell, and saving throw progression, though they have a different selection of spells available to them (see Part III). Druids receive a +2 bonus to saving throws against all elemental-based attacks. They may use all magical items available to clerics, except spell scrolls or armor forbidden to them. Druids have no power over the undead. A minor (4 HD) elemental as a permanent companion. If slain, it cannot be replaced for one year. Druidic philosophy accepts the survival of the fittest as a moral principle, which is why druids advance within their ranks through combat. At any given time, there can be no more than four Master Druids, two Archdruids, and one High Druid. A character who attains sufficient experience points to reach one of these levels must defeat one of the existing druids at this rank in battle before he can advance in level. The loser of such a competition drops in experience points to the level below the one he was seeking. Rematches are possible once sufficient experience points are later acquired, but many such contests are to the death, which discourages all but the most powerful and confident druids from seeking the highest ranks within their hierarchy. There are rumors of esoteric druid levels beyond High Druid. If they exist, few can attest to their existence and powers. 2nd level: The ability to identify animals and plants, as well as the ability to discern whether water or food is pure, safe, or poisoned. At this level, gain the ability to pass through thick vegetation with neither a penalty to movement nor any evidence of their passing. 6th level: The ability to assume animal shapes, three times per day. Any normal animal may be chosen, from as small as a bat or rat to as large as approximately twice human size, such as a bear. A specific animal shape may be taken only one time per day, for unlimited duration. However, while in the form of an animal the druid has all the physical properties of that animal, while retaining his normal mental state. Transitioning from one form to another allows the druid to heal 1d6x10% of any damage that has been sustained to the previous form. In addition, druids become immune to charm and charm-like effects from sylvan and elemental beings. I like the way that this preserves the traditional tropes but integrates them into a context that makes them both meaningful and sinister. If this doesn't purge the druids of their "dirty hippies stomping out campfires" image, nothing will. Consider this tentatively filched for my Whitebox campaign. For irony's sake, I think I'll try to grab some Jack Chick drawings of druids to complement the text. I like what you've done, James. I'm curious, however, about the process of a cleric becoming a druid. Would the cleric become a druid of equal level to that of his [previous?] cleric level? Would the cleric cease advancing as a cleric, retaining his cleric level, but losing access to cleric spell/turn undead, and begin advancing as a 1st level druid? Something else, perhaps? 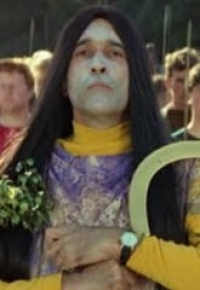 Your concept of Druid is kind of like the mideval witch/heretical catholic priest who kept getting burnt at the stake. Especially that animal changing bit. In fact the more I think about the better the archetype sounds. Ceremonies out in the woods etc mankinds pagan and animal nature vs. Civilization and authority of a monthiestic hierarchy. I'm really enjoying the captions lately! "Please ignore anachronistic wristwatch" and "The friendly face of nature" have both got a real life laugh out of me. Keep up the good work. Looking forward to seeing the spell list! But ultimately this all has me wantin to watch Wicker Man again! What's the reason for shape-changing curing damage? Isn't there a cliche of werewolves being found out because the wolf is wounded and the human retains the wound? I particularly like this interpretation of the druid. As James often points out, its a rough idea and not entirely logical but works very nicely providing excellent story material and atmosphere to the game. Some of the ways that it may not be entirely logical suggest different flavors of druids that might be entertaining. For instance, having to support balance where one day you may help townsfolk only to be against them the next is one way to proceed. Alternately, you could achieve balance by having sects of druids that seem to work at cross purposes. One sect might work well with civilized people and a different sect might be anti-civilization. This might even play out to the highest echelons of the druid hierarchy to interesting effect. The idea that druids are pro-survival of the fittest is somewhat at odds with the idea of balance. One could easily argue that "civilization" is fitter and that its ability to conquer nature is all well and good and perfectly balanced. But perhaps it could be more fun to hint that something is out of balance and the druids (perhaps alone) recognize a deeper "issue". Thanks for the creative interpretation. James, if I had one request I would love to know how you see your druids viewing undead (are they unnatural?) What about the other planes? The whole idea of what is natural versus what is not seems like a fun area for discussion. Doug: If they're in favor of survival of the fittest *individuals*, they would definitely be at odds with civilization. Society can mask an individual's weakness or shield them from the consequences of being unfit by lending them the strength of others; if Druids believe that the unfit should be weeded out then civilization would be an enemy to the cause. I find the idea that when a cleric becomes a druid changes what benefits they get really interesting. It’s unique, but still fits in really well. I can see why you might be hesitant to allow a PC druid though. What would you do if you had a cleric who wanted to become a druid? These druids need to read the Selfish Gene.